Chris Burden’s thought provoking large-scale kinetic sculpture, Metropolis II, asks questions about what comes next, after the car. 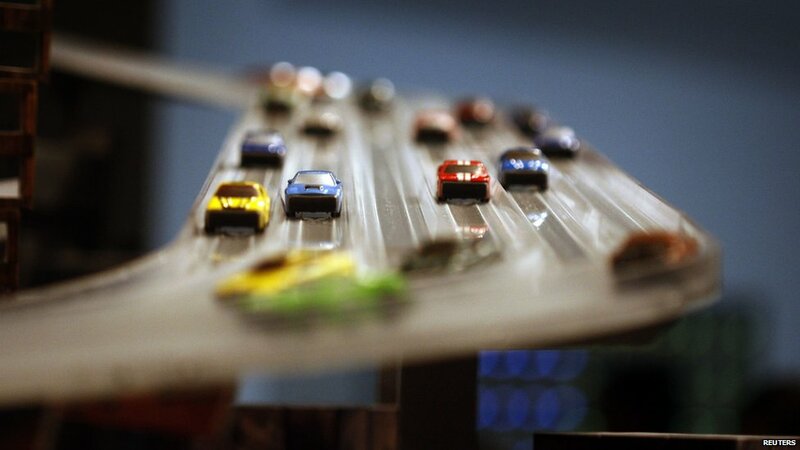 Reminiscent of the Fritz Lang film Metropolis the work portrays a futuristic city, populated by fast moving vehicles on transparent roads, As the cars thunder along the track Burden notes: “It’s not about making a scale model of anything, it’s to evoke the energy of a city.” The installation includes 1,100 miniature cars travelling at a scale speed of about 240mph. Chris Burden said: “The noise, the continuous flow of the trains, and the speeding toy cars, produces in the viewer the stress of living in a dynamic, active and bustling 21st Century city.” Metropolis II took four years to build and is constructed from a variety of materials, including wood, glass, ceramics and Lego. Link to Metropolis II on YouTube.